Now, you can. 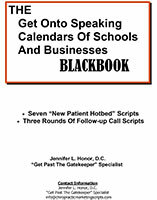 THE Get Onto Speaking Calendars Of Schools And Businesses BLACKBOOK system gives you everything you need to reach the decision maker and secure your speaking engagements, within your community's best locations. Dr. Jen created the Blackbook System following her years serving as a private consultant for fellow chiropractors, scheduling them to appear as guest speakers in those tough-to-get-into places. She even earned the nickname, “Get Past The Gatekeeper Specialist.” In the Blackbook, Dr. Jen has transcribed her entire technique- no stone left unturned- into an easy scripted format, so both doctors and C.A.s can do it themselves with smooth success. You’ll know precisely what to say, when to say it, and to whom. Zero guesswork. 1. 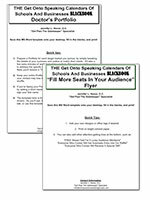 Seven “How To Get Onto Speaking Calendars” Scripts, one for each of your community’s seven time-tested “New Patient Hotbed” groups/businesses. This includes the school system. Have regular staff or other meetings, so you’re guaranteed an audience. Share certain physical, chemical and/or emotional stresses. Have a high percentage of women. Key, because women make most healthcare decisions for the family. Are well-connected cornerstones of the community, so additional opportunities will quickly follow. You’ll be asked to return, to speak at other branches, etc. Click here for another sample. 2. Follow-up Scripts. The full protocol for three rounds of follow-up calls. You’ll have the correct timing and verbage to “seal the deal”. 4. Doctor’s Portfolio Template. The problem with most portfolios? They’re too long, and wind up in the trash. This concise, all-inclusive portfolio includes a Presentation Summary, Outline and Doctor’s Bio. Fill in the blanks, add your logo, and print on desired paper. 5. “Fill More Seats In Your Audience” Flyer Template. Promotes your presentation via key buzz-words that excite people to attend. Add your lecture name and time, and print on desired paper. Send to the contact of your upcoming event, and you'll have a quickly-circulating advertisement that works. 6. Blackbook Audio Recording. Listen to Dr. Jennifer’s vocal inflections as she reads through every script. You’ll hear how she’s sounded, to get consistently positive results, so you can command the same. No need to spend thousands for marketing companies to schedule events for you. The Blackbook is an easy, affordable solution that you’ll use for the lifetime of your practice. If you make an honest effort to use this material per the instructions, and if you make it a regular part of your marketing campaign for the next 18 months, then within 18 months you will wind up with a minimum of 18 scheduled talks. Whether or not you follow through with all 18 is up to you, but you'll have 18 opportunities. If you have not achieved this at the end of 18 months, you are entitled to a full refund. See the policies page for full details. 1. Save $45 With A One-Time Investment Of $297.